Here is Mary Cecile Hancock with two trophy bears she took with the Abowyer screw on Bonehead 200 grain. Mary is in 7th grade, 13 years old and wrote the following testimonial. Excellent job Mary! "My dad surprised me with a trip to Alberta, Canada for a bear hunt. I got to miss the last week of my seventh grade year of school for my first time going to Canada. After learning where to measure and shoot the bear, we headed out with our guide, Adam. After Adam dropped us off we spotted a big bear. I could still hear the four-wheeler when the bear came in! The bear loved this sweet frosting thing. It bent down broadside by a tree 15 yards away. I shot my very first bear only 5 minutes being in the stand. It was a perfect shot, and the arrow completely passed through. The big sow ran less than 15 yards. Three days later I killed a big boar, also 15 yards away! We were in the stand for about 1 hour, and then this big bear, top of the barrel, approached the sweet frosting. It was in the bait for more than 20 minutes before I got a broadside shot. It finally turned broadside. I hit it a little too forward, good thing I had a heavy arrow because my arrow penetrated through both shoulders. Then when Adam came to pick us up, the tracking began. The blood trail started easy, but in one area there was only a drop of blood. We all saw my big boar! Adam put his headlight on the tree next to the bear because we were in thick woods. We hopped on the four-wheeler and loaded the bear up. After we loaded all of our equipment up on the four-wheeler, the quad died. We called the camp to send someone to get us. We had to spend another hour in the bait site knowing there was a bigger bear. What a wonderful experience I had! 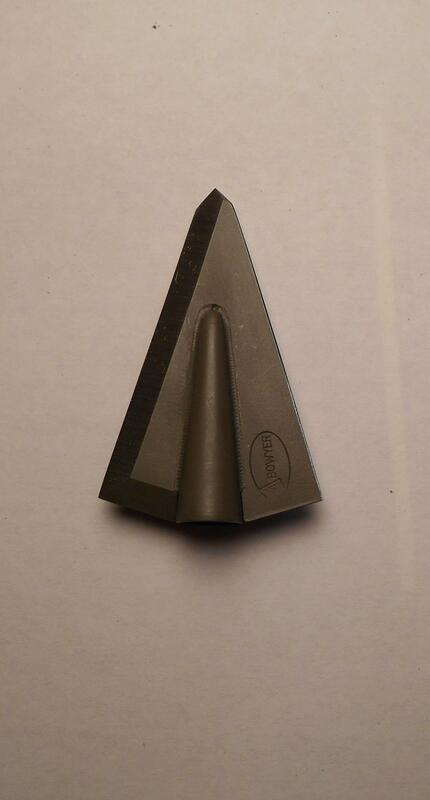 I want to thank Larry from Abowyer for making me the 200 grain brown bear broadheads. The penetration was amazing even out of a 41lb pull and a draw length of 24 inches out of my chill SDX. " "Bear shot in Wasilla Alaska with Abowyer Bone Head 145 gr. Put it down at 14 yds. Went 30 yds before expiring. Great job again by the Bone Head !!" 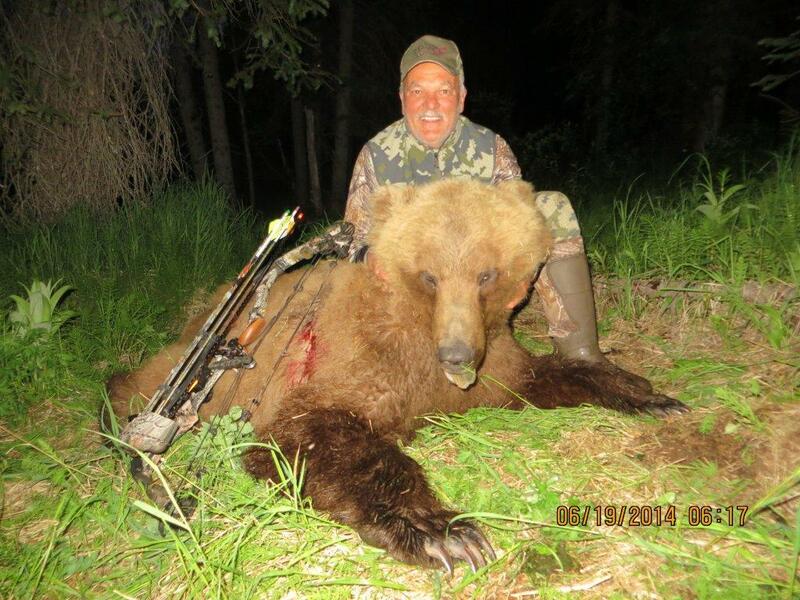 Here is Mike Windemuller with just an outstanding Alaskan brown bear! 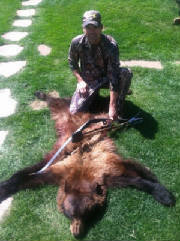 Mike took this with his recurve and an Abowyer Brown Bear broadhead. Mike was able to make a perfect broadside shot at this giant and all he did was look around a bit and tip over, talk about a low impact broadhead! Here is Paul Liberato with two nice bears he took while hunting in Northern Alberta. Paul was using his A&H ACS longbow and a Abowyer wapiti to take these two fine animals. Congratulations on the successful hunt Paul! 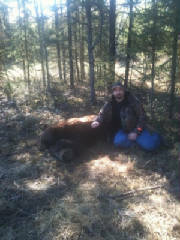 Here is Wesley McCain with a 450 pound 20” skull Alberta Brown Bear taken with his recurve and a Abowyer wapiti. Wesley shot him at 12 yards and the bear only traveled about 15 yards before expiring. 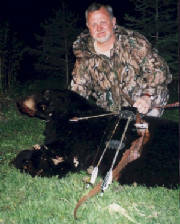 Tracy Dunn took this Minnesota black bear with her 39# Zipper bow and a Abowyer brown bear. She achieved a total pass through on this bear.